Sago Palm bonsai tree, aged 3 years old, measures 8" in height. Pot measures 5.5" x 4" x 2". This sago palm will make a great addition to any home or office. Sago Palm (Cycas revoluta) is an easy to care for bonsai for indoors. Free bottle of Green Green bonsai fertilizer free with every bonsai. The Schefflera arboricola 'Lucy Anne' bonsai tree, also known as the Hawaiian umbrella bonsai tree. 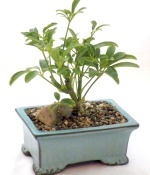 The schefflera bonsai tree is very hardy perfect for indoor environments. The bonsai 3 year old measures 9" tall the pot measures 5" x 3.5" x 2". 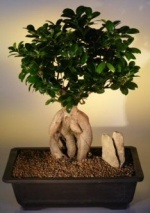 Free bottle of Green Green bonsai fertilizer with every bonsai purchase. 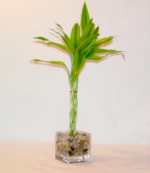 This 8 inch tall woven lucky bamboo comes with a glass cube vase and decorative accent rocks. Gold variegated foliage depicted in photo. 2nd day air is HIGHLY recommended throughout the year and especially from November through March due to the cold weather across the US. 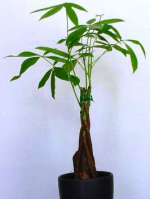 A Money Tree is five stems of a Pachira tree braided together to create a beautiful bonsai. The five lobed leaves of the Money Tree are believed to represent prosperity by the art of Feng Shui. A properly placed Money Tree in your home or office is said to increasing your prosperity and financial growth? Easy to care for and fast growing when given enough light. Three sizes available, select the one that is best for you. Price range is $17.95-71.95. Potted in an 15" rectangle brown mica container.